Excel Visual Basic for Applications (VBA) can be used to automate operations in Excel and is one of the most frequently used software programs for manipulating data and building models in banks and insurance companies. An Introduction to Excel VBA Programming: with Applications in Finance and Insurance introduces readers to the basic fundamentals of VBA Programming while demonstrating applications of VBA to solve real-world problems in finance and insurance. 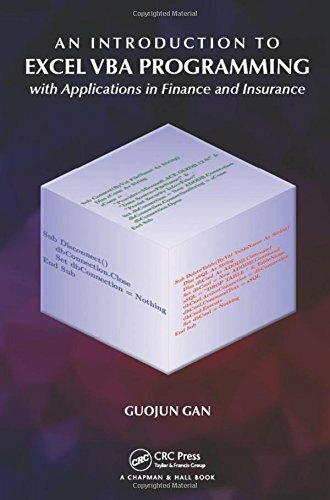 Assuming no prior programming experience and with reproducible examples using code and data, this text is suitable for advanced undergraduate students, graduate students, actuaries, and financial analysts who wish to learn VBA. If you have any questions about this product by Chapman and Hall/CRC, contact us by completing and submitting the form below. If you are looking for a specif part number, please include it with your message.